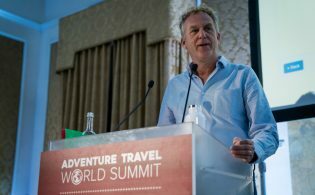 The Adventure Travel Trade Association (ATTA) has released a new report, “North American Adventure Travelers: Seeking Personal Growth, New Destinations, and Immersive Culture,” which offers insight into how adventure traveler preferences for activities and destinations have changed in the past decade. The report, sponsored by ATTA in collaboration with Outside magazine, shares the results of original survey research conducted by Paige P. Viren, Ph.D., and Alison K. Murray, Ph.D., of East Carolina University. Fielding a survey first used in 2006, the pair surveyed 8,000 Outside magazine subscribers for the research. Topping the list of activities popular with adventure travelers today and projected into the near future is hiking with 92 percent of respondents reporting they have participated in this activity and 52 percent indicating they plan to in the future. Hiking is also the activity adventure travelers said they participate in the most frequently. Following hiking, the activities cited most often by adventure travelers for future trips include visiting friends or family, stand-up paddleboarding, visiting historical sites, getting to know the locals, and cultural activities. In terms of activity frequency, the activities adventure travelers engage in most often after hiking are visiting friends or family, camping, road cycling, and skiing/snowboarding. When asked what activities they feel most belong in the “adventure travel” category, the top 10 activities respondents noted were hiking, backpacking, trekking, kayaking, rafting, climbing, mountain biking, scuba diving, caving, and camping. This marks a shift from 10 years ago, when the top activity identified with adventure travel was mountain or rock climbing. 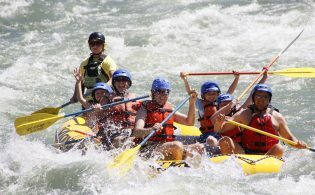 Another notable shift is found with respect to canoeing: Though canoeing ranked among the top five activities associated with adventure travel in 2006, in 2016 it ranked number 11. North American adventurers’ dreams of where they would like to travel appear to be expanding. Although North America unsurprisingly remains the most visited region for this group of travelers, it also topped their wish lists in 2007. In 2016, however, the region most respondents said they are planning to visit is New Zealand. Following New Zealand, the regions adventure travelers said they plan on visiting are Australia, South America, South Pacific, Western Europe, Central America, North America, Central Europe, the Caribbean, and Africa. The appearance of South America near the top of the list marks a shift from 2007: Though it ranked number seven among regions people hoped to visit in 2007, 10 years later it moved up to number three with more than half of respondents — 54 percent — saying they plan to visit. Similarly, Central Europe is a new region to appear in the top 10 with 44 percent of respondents in 2016 indicating they plan to visit the region. In 2007, Central Europe ranked number 13 on the list with only 31 percent of respondents saying they were planning to visit the area. 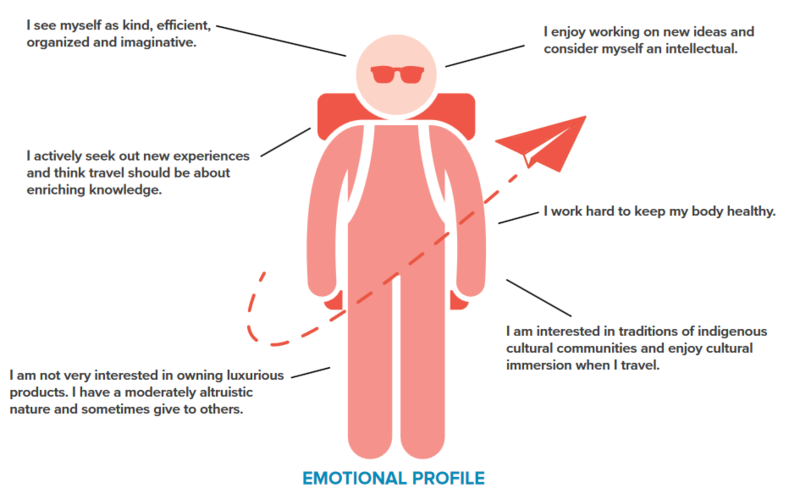 Respondents were asked to select adjectives to describe how they see themselves in everyday life and to describe their personal interests and feelings about travel. The profile emerging from these results reveals adventure travelers see themselves as kind, efficient, organized, and imaginative. They enjoy working on new ideas and consider themselves to be intellectual. Additionally, they are interested in the traditions of indigenous cultural communities. They work hard to keep their bodies healthy. They are moderately altruistic and sometimes give to others, and when they travel, they seek out new experiences and enriching knowledge. 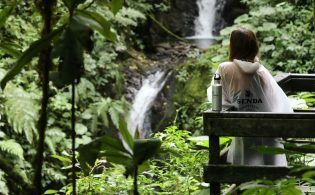 Adventure travelers do not see themselves as keenly interested in competition or shopping; in fact, the phrases “winning is extremely important” and “acquiring valuable products is important to me” ranked the lowest. The research sample was stratified for gender, and responses were weighted to achieve a balanced response from men and women. Learn more about how adventure travelers, and the industry they are propelling, is evolving when you download the full report, available here. Very good research, thanks for sharing! It’s no wonder New Zealand tops the global list of destinations North American adventure travelers plan to visit. Having recently returned from a sales mission there for my Philippine-based Tribal Adventures company, I was amazed that after a heady day of activity no one picked up their devices, and everyone engaged in animated conversation with each other: The Kiwi adventure experience engages everyone 100%.